Not every Adwords Agency Delivers. Few Agencies match our Google Adwords Management Expertise. Since 2002 the hands on experts who will be managing your campaign have already represented Australia’s most respected brands in highly competitive industries with Google budgets well in excess of $50,000 per month. Exposure at the top of Google’s search results page through a campaign managed by our Google Adwords Experts ensures our clients PPC Management Campaigns attract the right qualified traffic of buyers at the lowest cost per click and provide the greatest level of return on investment. 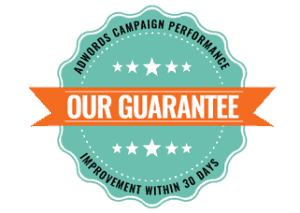 OUR GUARANTEE: We guarantee campaign performance improvement within the first 30 days. Using our custom tools, we’re able to research and provide our clients an accurate recommendation for their required Google Adwords Management Budget each month to prominently feature and dominate impression share against industry competitors in the most cost effective manner.We report on metrics such as Cost Per Click (CPC), and ultimately the Cost Per Acquisition (CPA). Google Adwords Agency managed campaigns continue to represent a large component of our client’s overall digital advertising budget and online marketing success. Regretfully we find the majority of campaigns managed by a competing Google Adwords Agency is very poorly managed. Often campaigns we see have quite poorly written ad creative, campaign structures are created inefficiently and often the keyword phrase spread being targeted by the current Google Adwords Agency fails to revise and increase the negative keyword list as part of how a well refined Google Adwords Management campaign should run. Many of these oversights, result in clients over spending on their campaign with Google together with being financially disadvantaged by a Google Adwords Management fee often calculated as a percentage of Google Spend. It is for this very reason that prior to any commitment of new clients coming on board we provide a complimentary Google Adwords Management Audit on a no commitment basis. This helps us commence our potential business relationship with a communication piece with you that is data driven and factual, rather than be dealing with any other Google Adwords Agency where you may be communicating with a business development manager that seeks to hit their sales KPI of new clients before the deadline date each month. Our Google Adwords Management Service commences with a complimentary Google Adwords Campaign Audit of your current campaign without any commitment on your part. Our team develop a deeper understanding of your business, its service and product offering, its audience, competitors and online objectives. We retain this completed brief to hand, when diving deeper into the technical review and campaign structure of how your campaign was being managed by your previous Google Adwords Agency. While many Google Adwords Service campaigns require a complete rebuild, there is often enough data to create a new campaign in an efficient manner. Our Google Adwords Agency experts analyse your industry phrases, your competitors and with the right tools and research are able to revert back to you with the indicative recommended Google spend investment each month for your industry. With keyword phrase and Google Remarketing creative approved, our team can have your campaign running typically within days. Monthly reports are custom created to demonstrate the month to month progress across all key metrics of conversions, cost per click, cost per acquisition and more, providing you with the transparency to know that your investment is well spent and your business is experiencing the Google Adwords Service return on investment you deserve. How does Google AdWords Management work? Our Google Certified Campaign Manager will gain a comprehensive understanding of your overall online marketing objectives, and identify how Adwords can drive tangible commercial benefit to your company. We identify and compile a list of the most popular and commonly searched key phrases for your industry, and guide you through the strategic selection of the right keywords for your business. The core focus of bid management is to deploy the right strategy that will deliver the most cost-efficient, measurable and valuable results from your Adwords campaign. Our team implement compelling, best practice, high conversion ad copy to ensure click-worthy ads are driving traffic to your website. When your Adwords Campaign is launched, our team monitor it’s performance closely ensuring all aspects of the campaign are functioning correctly. Simply provide your current Google Adwords Campaign ID number and look out for our invitation for you to accept within your Adwords dashboard. This kickstarts our complimentary audit in which 99% of cases we identify significant campaign improvement opportunities. Prepare for a long term business relationship based on ongoing results by a proven Google Adwords Agency.